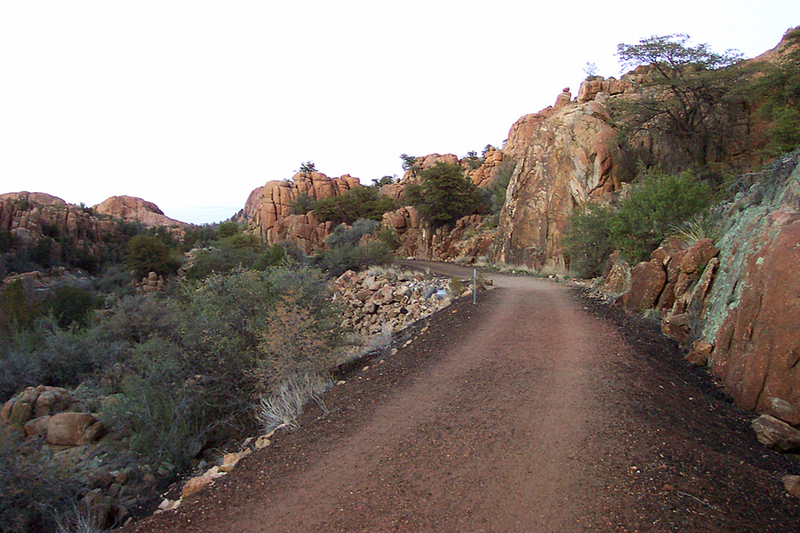 The Peavine Trail follows the route of the old Santa Fe, Prescott and Phoenix Railroad through Granite Dells, north of Prescott. The S.F.P.& P. Railroad (nicknamed "The Peavine") was built in the early 1890's from Ash Fork, south through Prescott, and eventually to Phoenix, to provide an alternative to the poorly constructed Prescott and Arizona Central Railroad, and to serve the mining country of the Prescott area. When the tracks were removed from Prescott in the early 1990's, a project began to turn some of the old railroad grade into a recreation trail, hence the Iron King and Peavine Trails. Beginning at the trailhead just south of Watson Lake, the trail heads northeast and parallels Granite Creek and its forest of cottonwoods. 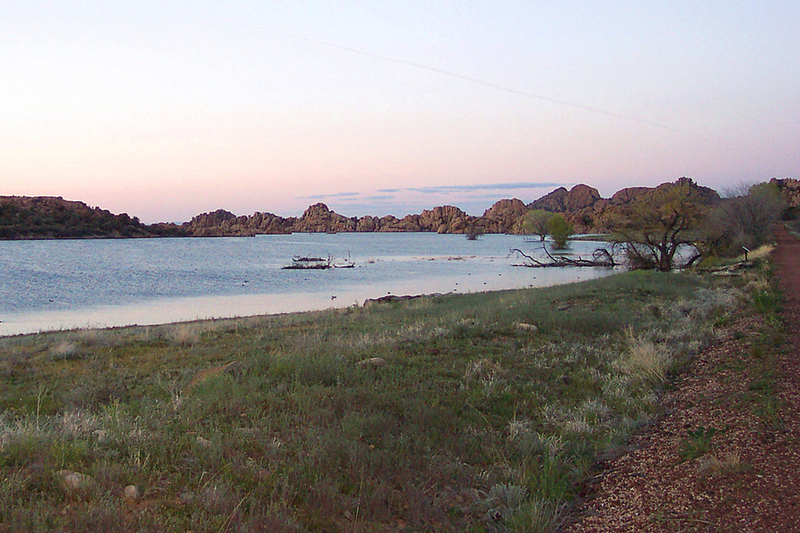 The trail soon passes along the eastern shores of Watson Lake, then gradually enters the natural stone sculptures of Granite Dells. At the halfway point, the trail passes an opening in the rocks, allowing for a great view of Granite Mountain across Watson Lake. The trail curves through the dells, passing through old cuts in the granite bedrock, where the railroad construction crews blasted a path for the iron horse over a century ago. I soon forgot that I was near a major city, as I traveled through the orange and pink hued granite. While you travel through this maze of rocks, it is easy to see why Granite Dells was used as a hideout by highwaymen and hostile Indians. After a couple miles of gentle downhill through the pinyon pines, the trail arrives at what was once known as Prescott and Eastern Junction. Here, beneath two large granite buttes, is where the P.& E. Railroad left for the mining towns of Humboldt, Mayer, Crown King and Poland. During the early days of the railroad, this was a busy spot, complete with a depot and a railroad worker's bunkhouse. From here, you can return the way you came, or turn east onto the Iron King Trail for some more rails-to-trails hiking. As a lifelong railroad fan, it was sad to see these tracks removed, but it is nice that one can hike the old railroad route and relive the history. Mtnlver writes: If you are taking 17 to highway 69 towards Prescott, turn right at Prescott Lakes Parkway. After about 2 miles, take a right at Sundog Ranch Rd. On your left will be a large parking lot and the trailhead for the Peavine. You will see the the trailhead for Lakeshore Trail at the one mile marker of the Peavine. Preston Sands writes: From the highway 69/highway 89 junction in Prescott, head north about 2.3 miles, and turn right at Prescott Lakes Parkway. After about 0.25 miles, there will be a large parking area on the left. This is the trailhead.